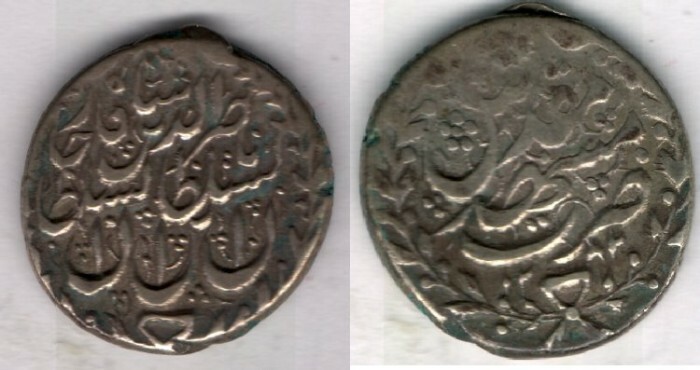 In Farsi reads: �al-Sultan ibn al-sultan, Nasir al-din Shah QajarZ"
Good VF, nice black toning, very deep and sharp strike. Nasir al-din Shah was the son of Muhammad Shah Qajar and the father of Muzaffar al Din Shah. He ruled Iran for almost 50 years and just before the celebration of his half a century reign was assasinated in the southern part of Tehran. He made two trips to Europe during his reign.